The genesis of energy directed weapons was the work of Albert Einstein. Einstein's 1905 Special Theory of Relativity related electric and magnetic forces in the equation E=mc 2 . The equation demonstrated that even particles of small mass moving at the speed of light possess tremendous energy. 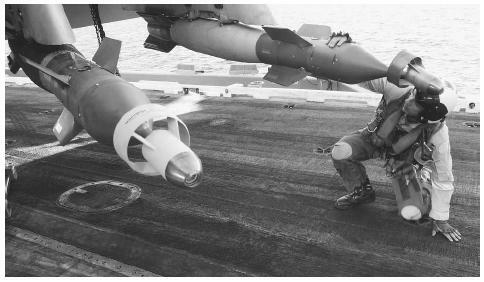 A U.S. Navy pilot inspects the laser guided weapons aboard his F/A-18C Hornet prior to his mission from the aircraft carrier USS Theodore Roosevelt. In These Times. "Now You See, Now You Don't." The Institute for Public Affairs. September 27, 2002. < http://www.inthesetimes.com/issue/26/24/news1.shtml >(17 December 2002). Lexington Institute, 1600 Wilson Boulevard, Suite 900, Arlington VA 22209. (703) 522–5828. < http://www.lexingtoninstitute.org/defense/energyforum_thompson.htm >.